The days have turned gray again after some teasers of the warmer weather to come. I got up feeling as gray as the sky. After my morning walk I decided some color therapy was in order. I unpacked some precut fabric squares that I had sorted awhile ago to make some quilted placemats. I spent the afternoon gazing at a riot of color as I connected squares one to the other on my sewing machine. My eyes took in the kaleidoscope of colors. My soul sang with the vibrancy and excitement of a new project. I was saved once more from the gloom. 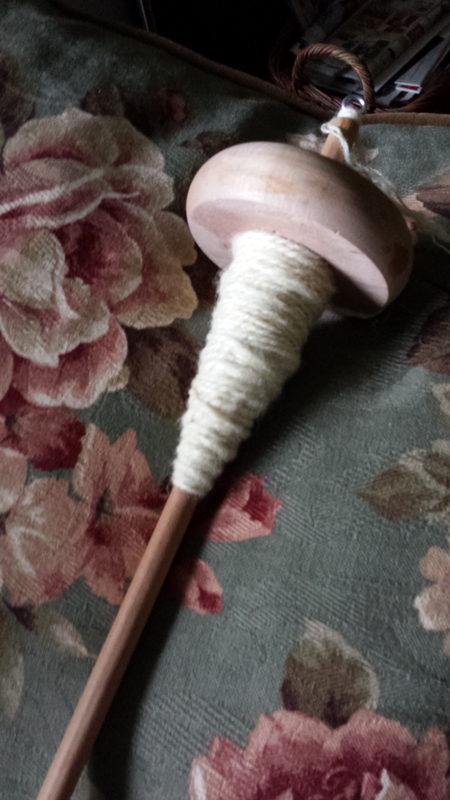 First ever plying on my drop spindle. Yesterday Kromski Minstrel 80/20 merino silk blended on my drum carder…Thich Nhat Hanh on Audible…birds and squirrel feeding outside my studio window…life is good. I feel like I am emerging from a cocoon. In this case the cocoon was a 7 month long Pacific Northwest Winter – over 100 inches of rain since October and counting. I really am grateful that the drought in the rest of California south if us has been declared over. But I am more than ready for this long rainy winter to end. The good news is that we are starting to get a few sun days in between stints of Spring showers. Our yard is starting to come alive in flowers. 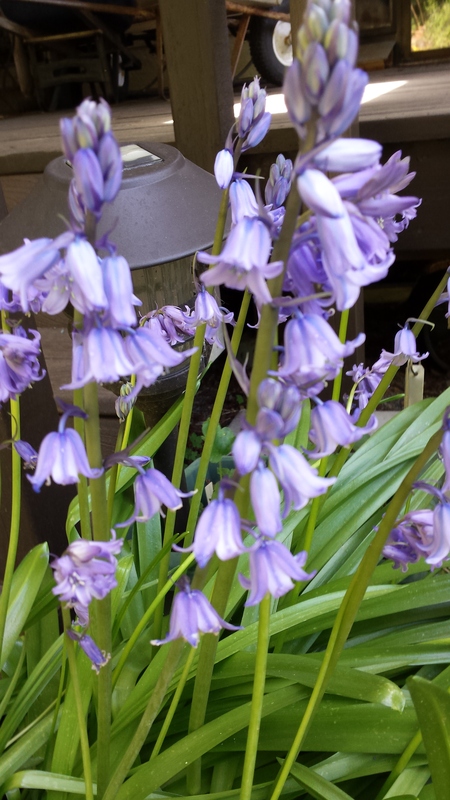 The camellias and native azaleas are blooming and so are the bluebells. My English husband looks for these blooms each year to remind him of fields of them in his native Yorkshire when he was a boy. Right now I am grateful to be sipping a glass of merlot as the sun baks through the clouds and lights up the corner windows as I write this. Happy Spring all!! Our redwood trees started shedding the first dried branchlets this week. It’s a gray day with a hint of cool drizzle in the air – a jeans and sweatshirt day. My antidote to the grey is this merino yarn I had spun awhile ago and put in my stash. 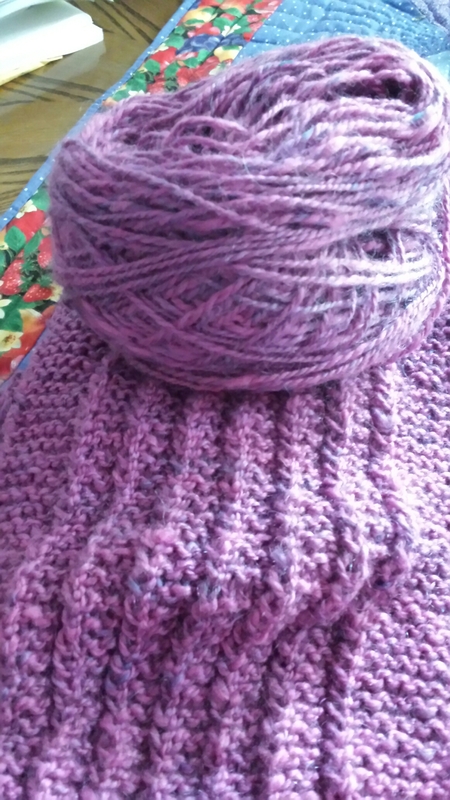 Easy pattern for a scarf and great color. 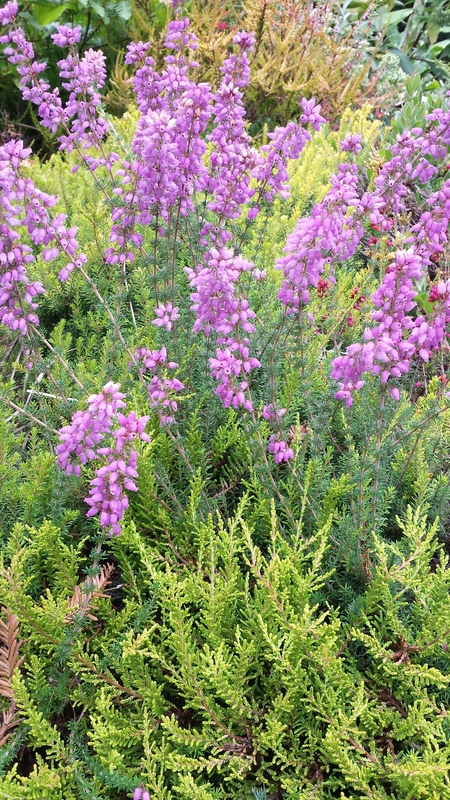 I also love the color contrast of this heather flowering in our garden right now. I have learned some valuable lessons from participating in Tour de Fleece. One we all know but don’t always apply: Practice makes perfect. I have seen a steady improvement in my spinning over the course of the tour. 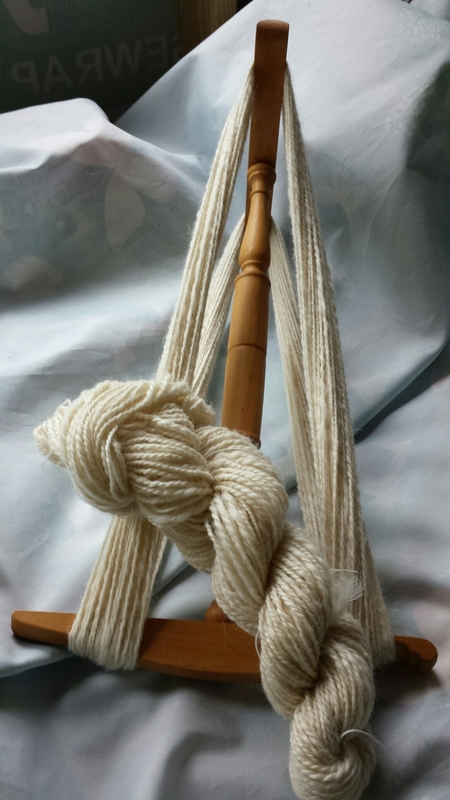 I am more consistent in my spinning as well as being able to better control the thickness and twist of my yarn. Today I have almost 600 yards of Corriedale drying in the sun. 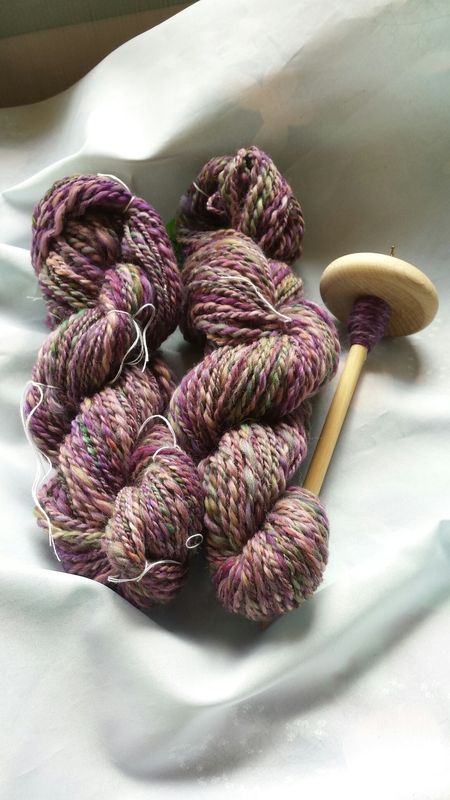 This was my latest plying yesterday. I have always avoided wearing white. One reason is that I have always had small dogs who jump all over me. But another reason is that I wore white dresses in countless church ceremonies in my former life as a Catholic child. 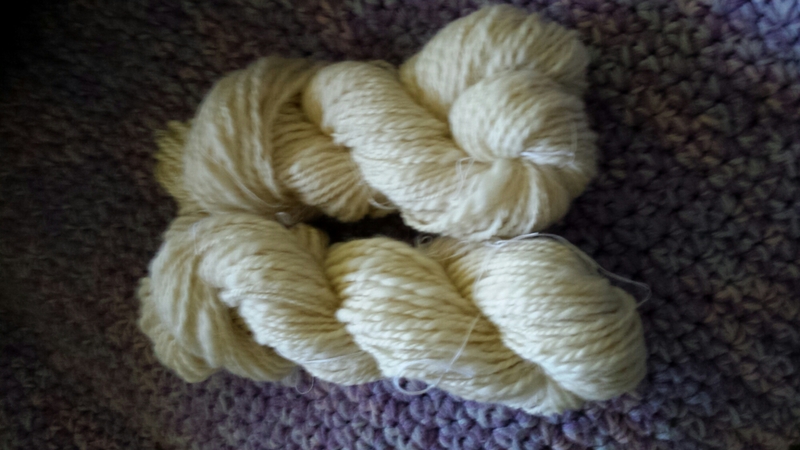 But I am looking at this yarn differently because of a remark on the internet the other day from a fellow spinner about loving the purity of undyed fiber. I think this yarn will knit up as a nice vest once I finish spinning the rest of it. And it is off white after all. Color is still my passion. But it’s nice to broaden my view as so much of the information from this tour has done. I have been spinning almost every day during Tour de Fleece. I have been so inspired seeing photos of what everyone else is spinning and posts about what they are learning! One of my goals during the tour was to learn Andean plying. So this morning I hunkered down and followed some links to diagrams and online videos. At first what looks like a relatively simple technique twisted my brain. But I took several breaks and persevered. The picture below shows some yarn I plyed yesterday from shingles I had spun the last couple of days. 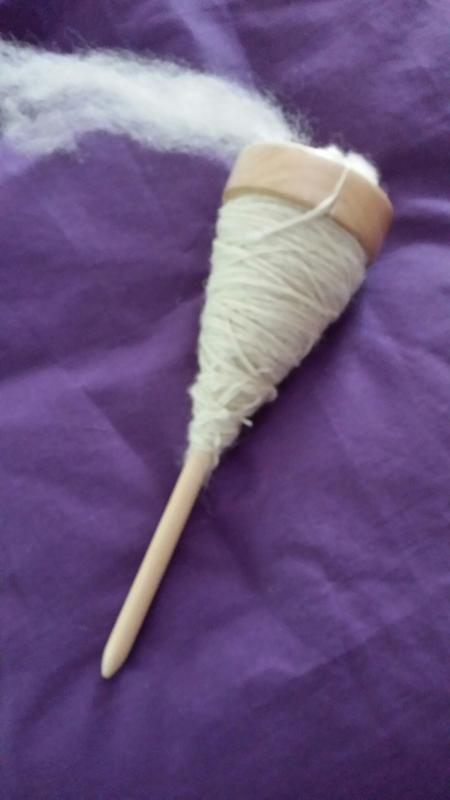 The drop spindle has what was left on one bobbin successfully and plyed after numerous practice runs with waste yarn. I have been so grateful to see the work of so many wonderful spinners online and be able to learn from them during this event. Today has been mostly cloudy after almost 1 and a half inches of gentle rain in 24 hours. But that is always perfect weather to find sanctuary in my little studio. Here is today’s Tour de Fleece installment of a bobbin of Shetland singles on my Kromski Minstrel. 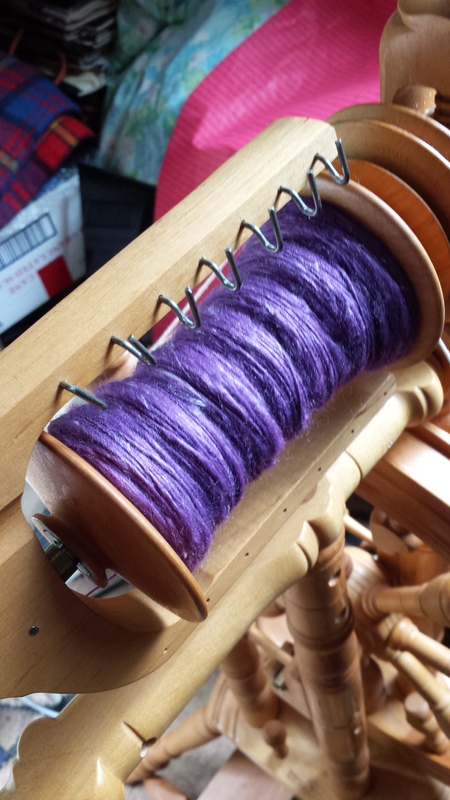 Thai is my first time spinning Shetland and thank goodness I am enjoying it as I have 2 pounds! 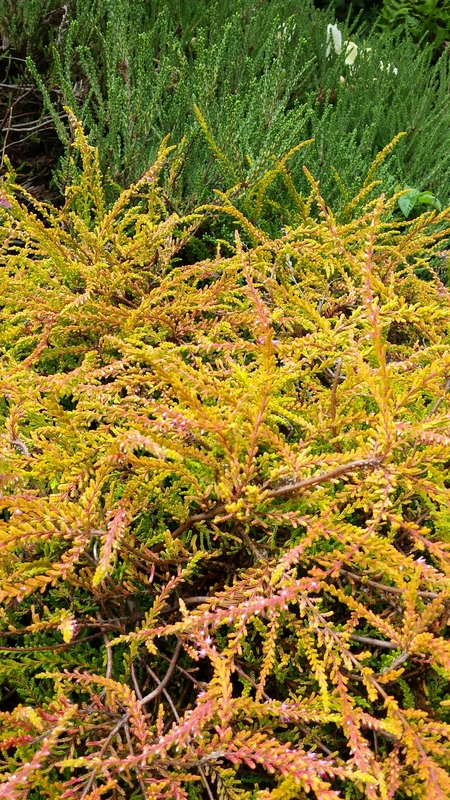 I have been appreciating the vibrant colors in these heathers in our garden. 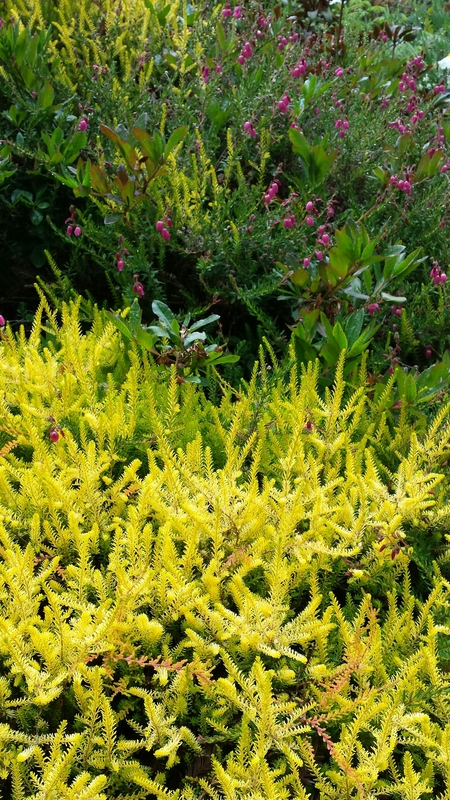 Even when they are not flowering the foliage often adds a stunning contrast. 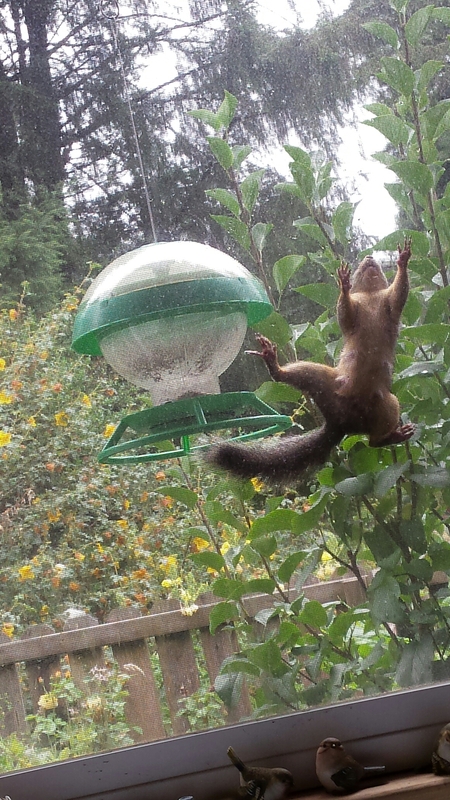 As I was spinning, one of our resident squirrels hung from the window screen and was undeterred by my presence in a quest for sunflower seeds and peanuts. An overcast morning cleared into a beautiful sunny afternoon. It was a great day for my next installment of Tour de Fleece spinning. 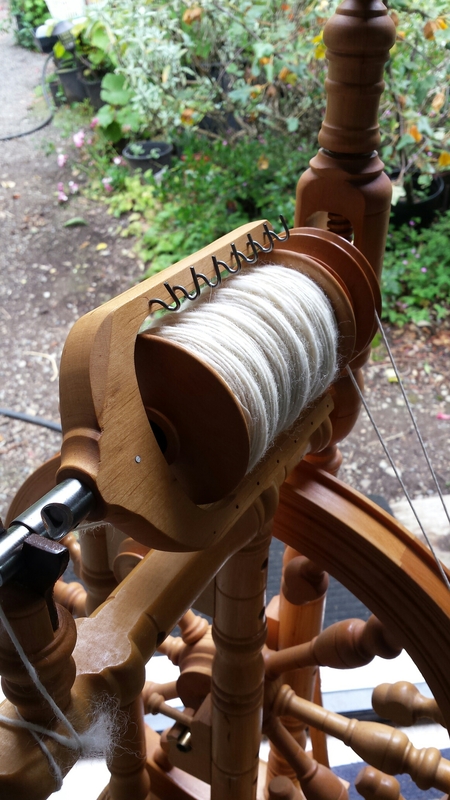 This morning I felt like working with my drop spindle for a while. 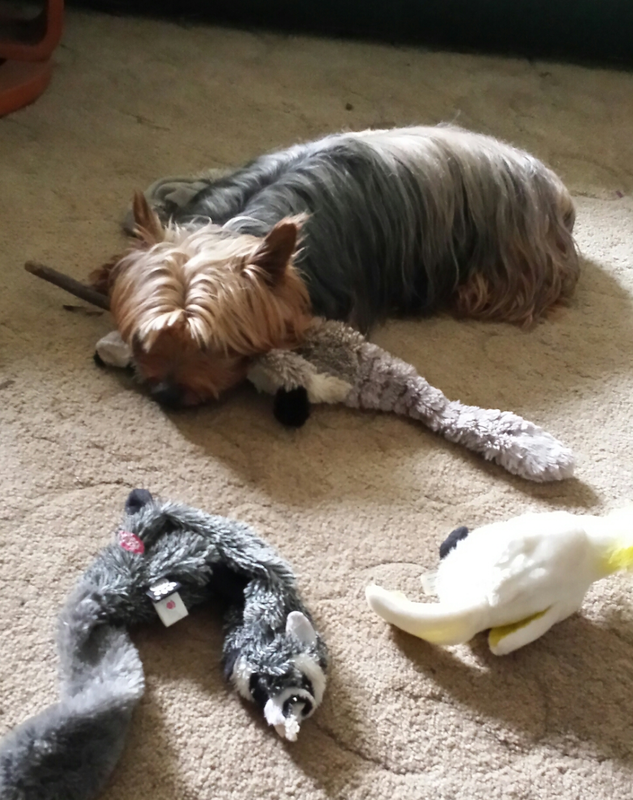 While I was spinning my silky terrier Spencer was resting from a rousing round of chase the weasels and birds. This afternoon’s results are from plyiing the singles from Days 2 to 4. 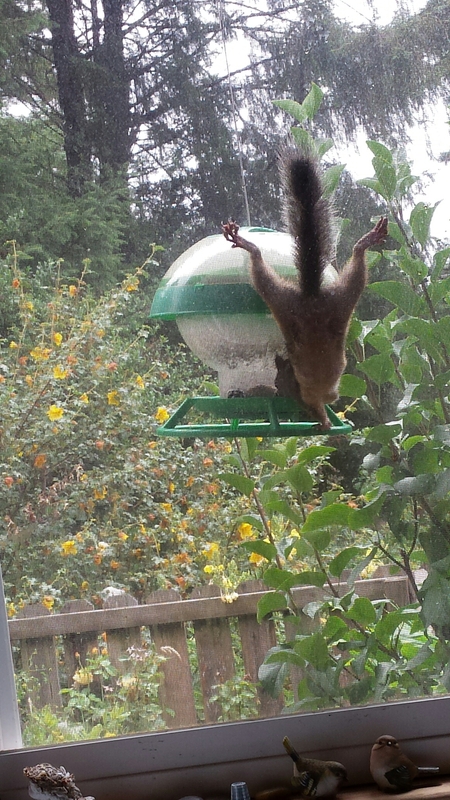 While I was plying in my studio the bird feeder hanging outside the window was visited by sparrows, goldfinches and a tree squirrel. None of them seemed to mind that I was spinning in the studio about 3 feet away from the window. I'm a longtime weaver who likes to weave fabric for clothing. My spiral motif rigid heddle Mermaid Scarf appeared on the cover of the Nov/Dec 2015 issue of Handwoven magazine. I invented the freeform overshot weaving technique with which I wove my Mermaid Scarf. I sell weaving patterns and instructional booklets in my Etsy shop. I like complex patterns, hand dyed yarns, high quality fibers and customers who want me to make them something special.